Size of the House: We believe smaller, well designed and detailed homes are more useful, enjoyable and efficient than bigger, lower quality homes. We look at your existing home as an ‘opportunity’ not necessarily as a tear down. (Although sometimes tear down is the best answer). When building new homes or adding on we design toward optimal efficiency and enjoyment. Orientation of the House: We believe in siting the house for optimal passive solar orientation and for suitability with your land. The Envelope: We believe in a very well detailed, very well insulated building envelope (the walls, roof and foundation and windows ). If you build it right you will spend a lot less money heating and cooling your home, you will minimize the opportunity for mold, mildew, rodents, dust mites, etc. AND the house will last longer with less maintenance. The Heating and Cooling Systems: We believe that every home owner should have a comfortable, easy to use, low cost way to control their living environment. Whether you are heating and cooling your house with oil, gas, electricity or an alternative source (such as photovoltaics, solar panels, geothermal, stoves, etc.) we are practiced in integrating the most efficient system or combination of systems to fit your needs, budget or lifestyle. We know the products and the people to install them. We know the pro’s and cons of each and their impact on your lifestyle. The Appliances, Lighting and Plumbing Fixtures: We believe in using quality products that reduce your energy use and that impact the environment as minimally as possible while still allowing you to enjoy the modern conveniences that we are all familiar with. We have years of experience specifying energy efficient green equipment and fixtures. The Finishes: We believe in using environmentally friendly finishes and furnishings that are good for the earth and good for you. We know which products are durable and high quality and not just a fad. We know how to use or apply certain products so that they last and work for you. We know alternative sources to get the latest green products. We love to give existing houses facelifts! Saving what we can of an existing home is perhaps the most 'green' thing we can do as architects and builders. I drive around and see the potential in every small and tired house. I can't help it! Perhaps it is like a hairdresser instantly giving a client a make-over in their mind as they walk in the door. I see the many possibilities of composing beauty out of almost any house and I love doing it ~ it is one of the best parts of our job. AND there is a great added benefit! If your house is in need of a curb appeal 'facelift' it probably means new windows or new siding or both...maybe a new entry porch and maybe a small addition are also on the agenda. All of these things offer the PERFECT opportunity for what is called a 'Deep Energy Retrofit'. Usually this entails re-insulating walls and roofs, and caulking around windows, doors, and other gaps, all of which is amazingly easy to do once the siding is off the house. And new windows will greatly enhance your energy efficiency if your existing windows are not up to modern specs. So what better time to make your house really energy efficient than when you are doing a 'facelift'? Once your home is tighter and better insulated, you can consider upgrading the HVAC system and maybe adding a solar PV system. We always tell our clients: the place to start is the building envelope. If the building envelope is super insulated and well sealed, then the size of your new HVAC system can be much smaller. Don't update your HVAC until you have addressed the leaky building envelope. Ah the snow ~ There is nothing I geek out on more the day after a snow storm than driving around looking at other people's roofs. Last night we got 22" of snow in my home town. The way snow melts off of a house roof tells the story of the roof's insulation inside. Different amounts of snow tell the story in a different way. Heavy snow will tell the story more in icicles and what I call snow slumps—large swathes of snow falling down a roof. Why do icicles happen? Well really what is going on are called Ice Dams. 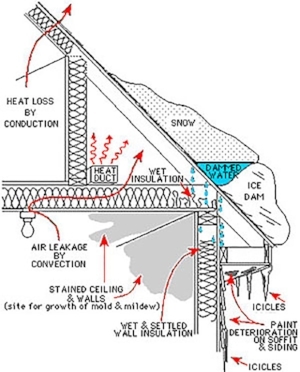 Ice dams happen when heat from inside the house flows out of the house- mostly through the roof (because heat rises). When the heat flows out through the roof (because there is not enough insulation) it melts the snow that is touching the roof. That melted snow turns to water and runs down the roof until it gets to the gutter/ eave and then it starts to drip down. However since the air is very cold (less than freezing) the water turns to ice and as more water comes dripping down the icicles grow longer. What's bad about this is that at the gutter line a LOT of ice is forming! And behind that ice the dripping down water that has not frozen yet is creeping into and behind your roof shingles, sometimes popping them up and often penetrating through to the interior of your house and then causing water damage in the ceiling near the roof eaves. Bad! The way this problem shows after a light snow fall is with stripes on a roof. Look at these 3 pictures. All 3 of these houses are neighbors, they face the same direction. ( and yes, sun and wind can often throw off the results!) They quickly reveal the levels of insulation in each house. House #1 has very poor insulation. You can see the white stripes at each roof rafter. There is likely no insulation between the rafters which is why you can see the black asphalt shingles showing. The heat from the house has poured through and melted all of the snow off the roof. Where the rafters are, the heat gets though more slowly and thus there is still a bit of snow clinging there- un-melted. You can also see at the over hangs and the porch roof below there is still all snow in tact. That is because there is no heat flowing through there- just cold outside air. House # 2 is less 'bad' but you can see the same patterns emerging. This house may be moderately insulated in the floor of the attic/ above the living space. By the way if you ever see the opposite- broad white stripes and thin black ones where the rafters are- that means there is some decent insulation in the rafters- probably batt insulation- but it pulls away from the rafters, or is not well installed, so it is letting heat sneak out right along the rafter lines. The third house (below) was recently built and I watched it go up and I happen to know that it was very well insulated with blow in insulation and sheathed with the Zip System which provides a great air infiltration barrier which inturn makes insulation perform to its highest potential. Good job! All of the snow is in tact! No heat is leaking through! Have a look at your roof today and the next few days as your roof melts! Do you need more insulation? BTW: simply insulating your roof can cut hundreds and hundreds of dollars off of your heating and cooling bill per year. Payback times for this kind of work are usually less than 2 years! Why not !!?? Here are some updated photos of the Rowayton House. It is getting its siding put on and Carlos and his team are doing a great job! The siding is James Hardie Hardie Board - a fiber cement composite product. The trim is MiraTEC which "are manufactured with environmentally preferable phenolic resins use recycled content and have no added formaldehyde". We are using these products because they greatly reduce the need for maintenance (including painting and cleaning with harsh chemicals) and last a very long time (both can easily go 20 years without a new paint job and will last indefinitely.) And by using these products we are not using raw natural recourses- like Cedar,etc. Plus these products look great. We are VERY picky regarding aesthetics and these pass the test. We have clad the house with a structural insulated sheathing (SIS) material from Dow (a 1" thick board that replaces normal sheathing- like plywood or OBS) that does the double job of giving stability to the framing and a continous layer of insulation for a much better thermal envelope (more on that in the Insulation Post which is coming I promise! I have been so busy and that post will be a meaty one!) Anyway the SIS also has the added benifit of providing an air barrier- sort of like Tyvek. We have taped all of the seams at the edges of each board and at each door and window,etc. Reducing the amount of air infiltrating into the house does the same thing that the airspace behind the shingles does- it tremendously reduces the amount of moisture and deterioration within the wall. And that cuts down on mold, mildew, dust mites and spiders,etc. never mind rot! AND it makes the insulation perform much better. Air moves moisture. Hot (air) moves toward cold, moist moves towards dry (usually via the air). Basic thermodynamics. We want moisute to stay out of walls and away from siding or anything else that likes to be eaten by mold and mildew. We want to control temperature and moisture. I always say: Its like a swimming pool. You don't want any cracks in your swimming pool. If you have cracks and you want your pool to be full- it will seep out thru the bottom. If you have cracks and you want your pool to be empty you will have water seeping in from underground. You want to control when water goes in and when it goes out. (You can't control it all- think splashing or evaporation.) But you can do you best to control it where you can. Then YOU decide when to add or subtract water. Your house is the same. Your walls are the same. YOU can control the air and moisture in your home (or you equipment can do so automatically. You can either have a passive or active system monitor your air and moisture.) But you know exactly how, when and where it is coming and going. This also allows for installing air filtration systems. A tight, well sealed, well insulated house is never lacking for fresh air if done correctly. Simple air exchange- fans,etc. easily assure the homeowner of pleanty of fresh air... More on that in the Insulation part also. Windows just keep getting better. Basically what you need to know as a homeowner is that the better you build and insulate your house walls, roof and foundation, the better windows you need to install. It all kind of goes hand in hand. If you put poor performance windows in a super insulated house you are going to have a lot of condensation-on-the-glass problems. Its physics. Moisture condenses out the air at the dew point. Dew point varies depending on conditions inside and outside. If warm moist air hits a cold window, water droplets will form and rip down the inside of your window. Not so good. So we always put really great windows in our really well insulated houses. But doesn't that cost a lot? Not really. Not relatively... and not if you look at the big picture. U-factor is the inverse of the R-Value (i.e. the term we use to show a material's resistance to heat flow), and it basically tells us the same thing. R-Value tells us how well insulation performs from an energy-efficiency perspective. U-Factor tells us the same about widows. With R-Value, the higher the better. With U-Factor, because it's the inverse of R-value, the lower the better. Right now in Zone 5 (All of Ct and MA and pats of NY) to meet 2012 IECC Code your windows need to be at U.32, to meet Energy Star you need U.28 or .27 depending on Solar Heat Gain Coefficient. Lets do the easy math. remember to U-Factor is the inverse of R-Value. R-Values are easier to understand so lets convert. The normal windows that we use are in the U.13 to U.17 range. They are generally triple pane windows from Europe or Canada. You can see that code seems sort of wimpy compared to the windows we normally use. Even Energy Star seems a bit tame. This is because the walls we are constructing also exceed the code required R Values by quite a bit. Most American windows get you to Energy Star and that is about it. We do use then for clients who want a 'lighter green' home. You can get a decent Energy Star window for the right house here in America. But we like to get the European whenever we can. The price is not that different when you compare apples to apples. They are not crazy expensive. What else is important when choosing a window? The Solar Heat Gain Coefficient (SHGC) basically refers to how much heat is going to come through the glass via the sun. Most Americans windows offer one SHGC and it is designed for the middle of the country. Basically north Carolina or Kansas. It blocks a lot of the sun becasue the whole souther half of the US has high cooling loads and need s to block sun form coming in. This is great for them and makes it easy to sell windows- one kind, less complicated- but its not good for the North East. We WANT solar heat gain for at least half the year. as conscious designers, we design to let the sun in to warm the house...we can't have our windows working against us! Other windows companies will make windows with different SHGC. We often choose different types of glazing for different sides of the house (N,S,E +W). This way we cna let the sun in where we want it and block it where we don't. Below is a typical window sticker. Its from 2009. You can see Energy Star's rating levels have gotten more stringent. The third box shown here is Visible Transmittance. Films that are applied to make the window more efficient will lead to less visibility and less solar heat gain. So sometimes if we have designed a house to work in a passive solar way, yet still want it to be very energy efficient, we have to play a trade off game. So, maybe we decide to make the south-facing windows less energy efficient than all of the others so that we can get that winter sun in to heat up the house. 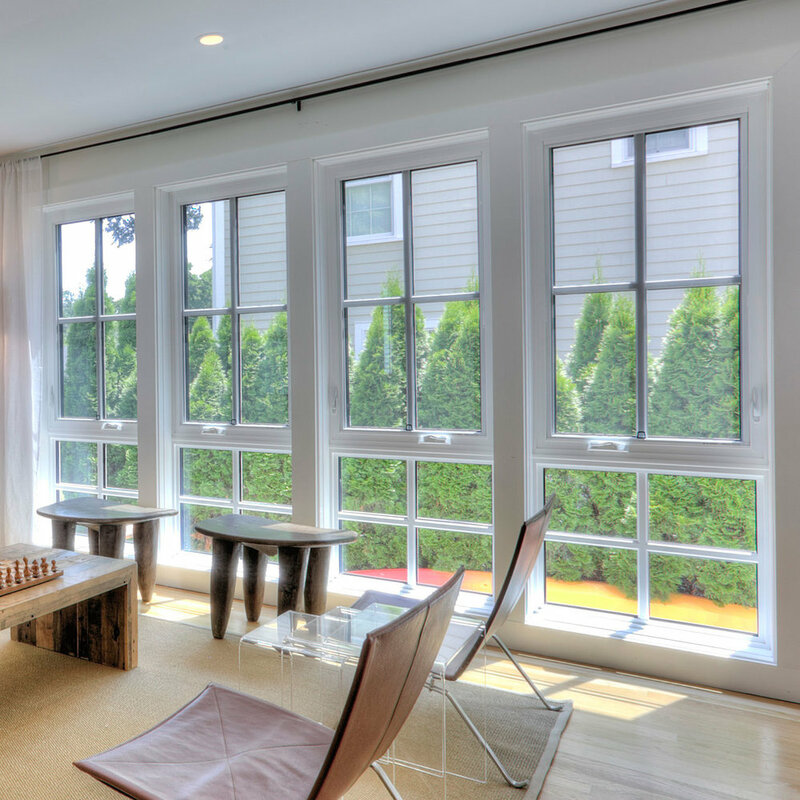 Below are some triple-pane tilt-and-turn European windows that have a U-Factor of .15. We encourage the use of ceiling fans! Especially in energy efficient houses because they make such an impact. Fans make the cooling season even shorter. Instead of using air conditioning - say 30 -60 days during the summer -you may use AC only 5-10 days during the summer. Our houses are designed for cross ventilation and fans. Cross ventilation alone is good, but if you add fans it makes it much more useful/ efficient- especially at night. How about with a geothermal system? "We have a geothermal system. Does this still apply? The cooling comes so efficiently from that system." Well, it costs electric to run the cooling for the geothermal (pump and fans). I guess its the difference between the electric for geothermal and fans...which is more? I just asked my contractor bud and he said fans would be cheaper than running the geothermal for sure. The number one basic rule in creating an energy efficient building is 'first address the envelope'. What does that mean? Well, when we say envelope we mean the outer shell of the house. The roof, all of the exterior walls. the bottom floor/ slab/ basement/ crawlspace (whichever the case may be.) So the first goal is to make that envelope a) very well insulated b) very well sealed by filling any holes, penetrations, nooks and crannies and cracksc) protected from moisture infiltration and d) protected from air infiltration. Basically I always use my swimming pool analogy. If you own aswimming pool, you want to be in control of when the water leaves or enters your pool. If your pool was full of little cracks you would have no control over the water. You would have to continually fill the pool and constantly adjust and observe water levels, and all sorts of problems would occur in the area of the cracks (the cracks get bigger, deterioration of the liner occurs faster, dirt and critters collect there,etc, etc.) You want the same for your house. YOU want to control when and where air and moisture come and go. Simple. Logical. Ok - back to the rules of the envelope list: a) very well insulated b) very well sealed by filling any holes, penetrations, nooks and crannies and cracksc) protected from moisture infiltration and d) protected from air infiltration. One other thing that the flow of air and moisture do is that they reduce the functional R-value of your insulation. SO now lets focus on the first item on the list - the insulation. There are many types of insulation and they are all rated by one rating system and labeled with something called an R-Value. R-Value is a measure of thermal Resistance. The higher the R-value the better the insulation is at keeping heat or coolinside your house at a steady temperature - this is because it is better at not allowing the heat to pass through it (either going out or coming in)...thus the term thermal resistance. Most houses that were built in the post war era used fiberglass batt insulation (the pink stuff, the stuff you don't want to touch or breathe, the pink pather stuff, the stuff as one insulator I know says 'works GREAT as a filter! Cause the air passes right through it! which makes it not so awesome at thermal resistance' ) Usually we find houses of this era built with 2x4 studs so that means there is fiberglass batt insulation- about 3.5" thick slumping in the walls. Unless fiberglass batt is meticulously installed and unless it never aged and pulled itself off its staples overtime - its not really filling the wall cavity. Bottom line- its not the best insulator, it needs to be really well installed and almost never is, it falls and gets dirty over time, its bad for you to work with, critters don't mind it. We never specify it. We can't even believe people still use it as their primary insulation. So what are the options. Well in the old days people used all sorts of things from straw to newspaper, to mud, tires, almost anything has been packed into walls. But we want something easily available, verifiably tested, regulated, readily installed, fire resistant, critter resistant, clean, mold and mildew free, etc. If we are going to make a good, well sealed, clean and healthy house we want insulations that work and work with our newer building methods. We are try to avoid foam products at this time. Their blowing agents are bad for the earth and the jury is still out on how bad these foams are for you health. Some people have negative reactions to foam and if there is ever a fire in your house, the foam is a disaster. True, they have been making the blowing agents much better, but the health reasons are still enough for us to ere to the side of caution. We will put foam in a house if the client requests. However, we find that there is generally a good and easy alternative. Below are some facts on R-values and blowing agents,etc. The ‘Off-the-Grid House’ in Litchfield County is all but done! The house and farm were selected to be on the Goshen Farm tour again this year and it was all just so beautiful. The house itself is a long stone structure facing south. The core exterior walls of the house were actually built using Durisol (a form of Insulated Concrete Form (ICF) but are made from natural fibers instead of the usual foam.) covered in stone veneer. The house is designed to be a Passive Solar house – in the old school way. (It was not certified Passive House, though I personally believe that if it was modeled and tested it would meet Passive House standards). Anyway, in old school Passive Solar design the idea is to build a house to face south and provide a lot of thermal mass within the house. The house warms up during the day and the thermal mass (usually concrete or stone) holds the heat and slowly releases it through the night. The whole thing is dependent on specifically designed overhangs curtains and fans to keep the sun in the house when it’s cold and out of the house when it’s warm. This entire house is bermed into the ground on the long North side (to about 8’ high). The long South side of the house is all windows (lower sliding glass doors and upper transoms) with overhangs that were very specifically designed to let the winter sun in and keep the summer sun out. The green house along about 1/3 of the south side will not only serve to grow food year round, but it also acts as a heat collector and buffer that allows the home owner to control the amount of heat in or out of the house. There are ceiling fans throughout the house as well as operable transoms that allow for a great breeze and air exchange during the temperate months. During the winter the house will use Lunos ERVs. Small super-efficient air exchangers. The house is heated only by a wood furnace that is kept in the back yard. There is a wood burning cooking stove as well inside the house which will also serve as a heating element. The fact is however that either of these will quickly over heat the super insulated house and will rarely be needed. There is no active cooling besides the old fashioned open windows and ceiling fans coupled with cool summer time concrete and stone. The whole house is off the grid. The red barn on the property has a 10 kW PV array that serves all of the 2,000 sf house’s needs. There is a root cellar along the back (North) bermed side of the house. It is basically a concrete and stone box. The floor is concrete with no insulation below. The two walls it shares with the main house are the insulated Durisol and stone walls. The other two walls and surrounded by earth for their full height. The roof has about 12” of insulation (foam) and is then covered with dirt. It all stays very, very cool (about 55 degrees) – even on the hottest days of the year. (There are no active vents in this root cellar. It seems to be working very well without a vent, though the home owner is keeping an eye out for moisture build up, it does not seem to be an issue. All of the water from the house gutters and from the footing drains is collected and directed to a site built pond on the lower portion of the site. This pond will serve as watering hole for the farm animals.